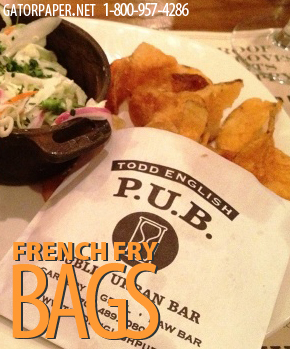 Custom Printed French Fry Bags from Gator Paper have just arrived! Everything your restaurant has been looking for and more. These French fry bags come is a variety of sizes and colors including white and Kraft brown. The bags are well made to lock in warmth with an easy fold over style finish. Check out the full line of quality restaurant supply products. Also review our color printing technology available for logo placement on each product your order. Brand marketing through quality products is a great tool for making your business a success. Gator Paper is here to supply everything you may need. Brand marketing through quality products! These French fry bags come is a variety of sizes and colors! Browse our full line of quality food packaging products and restaurant packaging supplies. We offer a variety of goods, from paper bags, clear plastic cups, custom printed handle shopping bags, beverage napkins, cushion foil paper, Kraft paper, dinner napkins and much more. Review our website for information on placing your order today. Whatever your business may need, we have a wide variety of food packaging products to make your business stand apart from all the rest.